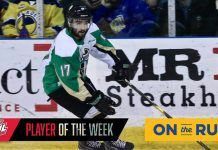 The Prince Albert Raiders have pushed their series to a decisive Game 7 following a 5-4 win over the Moose Jaw Warriors on Sunday evening at the Art Hauser Centre. The best-of-seven series is now tied at 3-3 after Curtis Miske had a four-point night and Cole Fonstad potted a pair of goals. The Raiders kept the momentum from Game 5 to take a lead near the midway mark on Sunday night. Miske fired a shot on Willms, who directed the rebound right to Fonstad. The Estevan product made no mistake in finding the open cage to put his team ahead. Before the end of the period, the Warriors tied the game. Brayden Burke skated from the faceoff circle and snapped it through Scott with 2:25 to play in the period. In the second, Miske restored the Raiders’ lead. He collected a rebound in the slot on a power play and found the back of the net to put Prince Albert back up 2-1. Near the end of the second, the Warriors scored twice in two minutes to take the lead. Burke tallied his second of the game with another shot that got through Scott with 3:42 to play in the frame. Then, Jayden Halbgewachs outwaited Scott to make it a 3-2 game in Moose Jaw’s favour. Before the end of the period, the Raiders tied it up again. Miske fired another shot on net that Willms couldn’t handle. The Raiders captain collected his own rebound and slid it to the front of the net. Sean Montgomery had his stick down on the ice and tapped it past Willms to tie it up at 3-3 heading into the third. Regan Nagy gave the Raiders the lead again early in the third. The overager from Ogema picked the top corner on an early power play to give the Raiders the 4-3 advantage. However, the Warriors battled back to tie it four minutes later. On a power play of their own, Brett Howden banked a shot in off Scott from behind the goal line to tie it up. Midway through the third, Fonstad gave the Raiders the lead for good. The 2018 NHL Draft eligible player batted a puck out of the air past Willms to put the Raiders ahead 5-4. The Raiders preserved the lead for the final 8:26 of the game to take the win and extend the series. Scott stopped 16 shots in the win. Willms made 27 saves in the loss. The series heads back to Moose Jaw for Game 7 on Tuesday night. Puck drop is at 7 p.m.